As August winds down, our wonderful fresh veggies and stone fruits are gradually going away here in the South. Oh, how we will miss them! As harvest season approaches for apples, pears, and pecans, I am already planning my fall recipes. My grandparents were farmers, and every fall we prepared ourselves for the “picking up” pecan season. I always thought it was fun walking in the orchards and seeing how many pecans we could gather. All of us cousins had the best time! My Dad’s parents’ home had a huge walnut tree growing right up next to the house. The reality is they probably built the house in that spot for shade during sweltering summers. Not in my wildest dreams would I have guessed that a delicious walnut grew inside those tennis ball-size green shells. At night, when you were almost asleep, one of those massive things would fall from the tree and hit the tin roof on the house. Wow! That took some getting used to. Shelling pecans was torture for me, but my dad loved it. He knew that soon enough the kitchen would fill with the aroma of scrumptious pecans roasting in the oven. Dad would put a pan full of pecan halves in the oven with butter and salt. Then the never-ending slow roasting would begin. 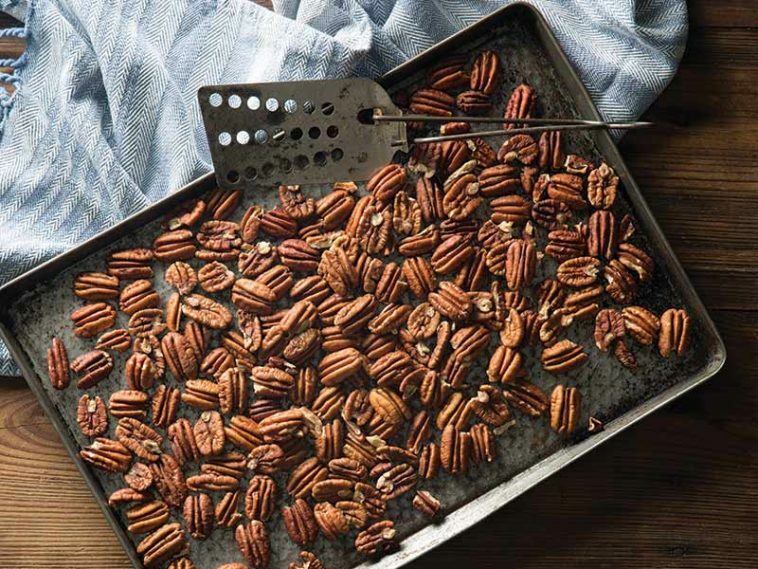 One little whiff of those pecans cooking was enough to drive us crazy. Dad devoted himself to the slow roasting process, firmly believing it was worth the wait. Each time he opened the oven door to stir them was a tease to each of us! Another fall favorite at our house was boiled peanuts. You simply start with green peanuts (unroasted) fresh from the field, wash them, and put them in boiling salty water (in the shell). Now I can just see many of your shaking your head at the thought of a boiled peanut, but that is a marvelous dish for a Saturday afternoon of watching football. What are your favorite fall treats? I would love to hear from you and find out what you love this time of year! 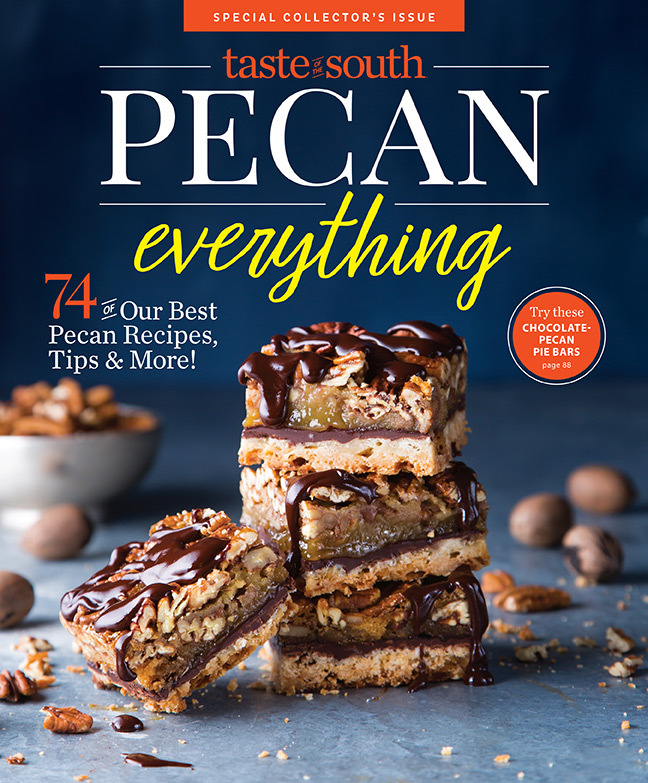 Find all the delicious pecan inspiration you need by clicking this special issue below! my Daddy planted 4 pecan trees. He faithfully fertilized them every year and about every other year we would pick up so many pecans we would just stoop down and rake them together to then put in large brown grocery sacks. I remember one year we had so many we sold them to Winn Dixie. We always loved the buttered, salted, toasted pecans my Daddy would prepare. Years later at another house my family bought there was another messy cherry tree in the backyard. Daddy cut it down & planted another pecan tree. After he died we found five one gallon jars in the freezer filled with pecan halves. That is so wonderful. Thank you for sharing. You were a very creative teacher…..love it. When my husband and I moved to CA in the 60’s , I was surprise to see what nuts looked like when they dropped from the trees since I grew up in the UP of MI. We would go to a friends ranch and pick up almonds, walnuts and pecans. We would hull them and roast them per instructions from friends. Those nuts were so delicious. We now live in Florida and our son brings us pecans from GA. Both our son and grandson love boiled peanuts but I am not fond of them, but I love being in the South. Here in the Midwest, fall always means apples and pumpkins. My mother canned applesauce in Mason jars just as she did all the produce from her large garden. I must have been nine or ten years old before I realized the people bought vegetables, fruits and pickles in cans and jars at the store. Growing up in Pennsylvania, I never heard of boiled peanuts, but when my husband took a position in Mississippi, I met a wonderful older lady who loved to tend her garden and cook. She introduced me to the most delicious southern recipes AND — boiled peanuts. She could fry a chicken like no other, bake a coconut cake fit for a queen, create the most heavenly ambrosia salad, and candy figs from her own trees, but nothing beat her boiled peanuts!! She would call me and say “I just pulled up a mess of peanuts and have put them on to boil”. A couple hours later, I would head to her humble little shotgun-style house with my three year old daughter in tow, and enjoy an afternoon of the most scrumptious peanuts, accompanied by tales of the olden days in the old south. Such a treat for a “northern yankee girl” far from home! I will never forget this kind and delightful woman and how welcome she made me feel. What memories!! I love the term “mess”. I have no idea where it came from, but my grandmothers referred to peas, beans, and anything that could be considered a pan full for supper as a “Mess”. My grandparents also had a black walnut tree in their yard. Those large nuts were hard as rocks and so hard to crack and shell, but they were delicious and so good in divinity! I remember as a tiny child sitting in a car outside the airport fence in Birmingham, AL eating parched peanuts as we watched the airplanes take off! Cars lined the fence then, along with the peanut man. It was a pasttime lost in Sept 2011. My parent’s parents were farmers in SC. One of my fondest memories is the day my uncle got up into an enormous pecan tree and shook it while pecans rained down upon our heads! We gathered pecans FOREVER that day! My father adored boiled peanuts and I am still in love with them. It’s hard finding the good, red peanuts that are green from the field instead of those bloated white ones you find in grocery stores today. But this summer, I actually have found red peanuts that are fresh and boiled them. I’ve relived my childhood eating boiled peanuts with my Daddy. As a youngster we had pecan trees. It was fun to gather the fallen nuts. My parents sold them to a local processing company and that was our Christmas money. Of course we always kept enough for holiday goodies-divinity, pralines, cakes and the famous pecan pie! I live in an area of Texas where there is an abundance of pecan trees. Every fall my friends & I take a day to pick up the delicious nuts. I take them to a cracker & then pick them out by hand. They come out of the shell almost always in halves. I freeze them & have pecans to use all year long and plenty to share with friends. Pecan pralines, pecan pie, & pecan muffins are some of my favorites. Pecans are one of fall’s treasures. My Mississippi raised Granddaddy used to boil peanuts. They were really an awesome treat. I haven’t found a recipe that compares to the peanuts he used to boil. My advice is the old saying “don’t knock it till you’ve tried it”. For me, fall is a time for apples….in pies, muffins, coffe cakes or just baking a few in the oven. Add to that the smell of cinnamon and it is pure heaven!! My mom’s apple pies were always the best…friends would always drop by for a piece of her pie and my brother and I would always scrape the last bits out of the pie plate. When I was little my dad was a Marine at Camp Lajune, and we lived in a mobile home park that was nestled right in the middle of a pecan grove. Every Fall was such a delight. My dad would give us all a large grocery bag, and then we four little girls went all over the park picking up pecans. We had lots of great pecan pies and cinnamon rolls topped with pecans. Also, one year he got some free toweling (the kind you used to see in bathrooms where you kept pulling the toweling down to clean toweling) and he and Mama would cut a length of it, pour a measured amount onto the toweling, and she would stitch it up and he would slap a mailing sticker on it, addressed to family in Mississippi and New York state. He said that for years he would see those towels hanging on the handles of the aunts’ stoves. I love those sweet memories. September is our hottest month in Florida so autumn is a long way off for us. No reason I can’t turn down the a/c inside and pretend with cider in hand. 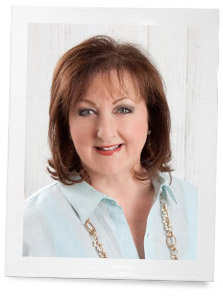 Phyllis you amaze me with your ability to write so many articles. I think one of your secret gifts for successful writing is your memory. You amaze me at what you recall and how vividly you can relive and retell it. Thank you for taking us back there with you! They are wonderful journeys. Thank you. I wish I could remember all the wonderful times I had at my grandparents house. It was always an adventure! Neighbors up the road lived on a pecan orchard. Every fall they’d deliver large sacks of nuts to all of us, so I never picked them myself. Besides, isn’t one supposed to shake them loose and gather the off the ground? Boiled peanuts used to be sold by small bags full on the streets of Tallahassee. Ahhh…..I missed those delightful afternoon treats to nibble on the city bus home from work. That was a long time ago for me. For some reason, autumn makes me want to add extra cinnamon to foods. It could be the same oatmeal, pears, sweet potatoes or apples that I fix for my family all year round. But when that crisp, cool fall weather settles in, I add extra spices, especially cinnamon to so many dishes. But your stories of the pecans and peanuts are wonderful. I can imagine how delicious they must have been for you and your family. Do you keep that tradition going? Daily after school chore for Christmas money! We did it on the ‘halves’ with the owner of our house and the huge orchard. I look forward to fresh apple cider, hot mulled cider, cider donuts, caramel apples, french apple pie, hearty soups and stews, and my mother in law’s chestnut stuffing. Fall is when I like to bake since the kitchen is cooler. I love walnuts most of all nuts and love to bake banana walnut chocolate chip bread. I also adore a good sweet potato pie.